Chrysler Group has abandoned plans for an initial public offering this year so it can sort out a U.S. tax issue, two sources familiar with the process told Reuters. An IPO is not likely until 2014, one of the people said, adding that underwriters were notified of the decision late last week. Fiat said Monday that it would "not be practicable" to complete a Chrysler IPO this year. Chrysler, which is majority owned by Italian automaker Fiat, was previously looking to kick off its IPO road show in early December. But the timeline hit a snag due to complications involving the conversion of Chrysler from a limited liability company to a C corporation, the people said. Most public companies are C corporations, and in Chrysler's case, the conversion to this structure would likely mean additional taxes, Peter Bible, chief risk officer of accounting firm EisnerAmper, said. As a limited liability corporation, Chrysler has few shareholders and passes losses and the responsibility of paying taxes to its owner. But a C corporation pays its own taxes, can have an unlimited number of shareholders and also bears a greater tax burden. Chrysler could not be immediately reached for comment. The people declined to be named because they were discussing confidential details. The delay is the latest twist in CEO Sergio Marchionne's effort to execute the next stage of the Fiat-Chrysler turnaround. Marchionne has led both automakers since Chrysler's 2009 U.S. government funded bankruptcy restructuring. Marchionne wants to formally merge the two companies and form the world's seventh-largest auto group. He has repeatedly said he would prefer to avoid an IPO for the time being. But Chrysler was forced to file IPO paperwork in late September after it failed to reach a reach a buyout deal with Chrysler's minority shareholder, a retiree healthcare trust tied to the UAW. Advisers were considering a valuation of about $10 billion for Chrysler, near the low end of the range considered, people with knowledge of the matter told Bloomberg. 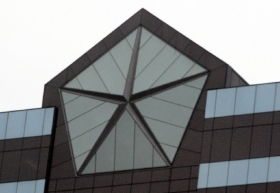 A union trust demanded the offering to resolve a pricing dispute with Fiat. "The IPO, as it was unfolding, wasn't a knockout punch for either side," said Erik Gordon, a professor at the University of Michigan's Ross School of Business and Michigan Law School. "Each side was overly optimistic. It left both sides in a position where maybe it was better to keep talking." Fiat and the UAW retiree medical trust aren't close to a deal that would give Fiat full ownership, two people told Bloomberg. The trust and Fiat are disputing Chrysler's value as Marchionne seeks to buy the union fund's 41.5 percent stake. Even a short delay would have had Chrysler's IPO -- slated for Dec. 11 -- running into competition from an offering of Hilton Worldwide Holdings Inc., one of the people told Reuters. The world's largest hotel operator is seeking about $2.25 billion in an IPO that is expected in December, people with knowledge of the matter told Bloomberg last week. "There's plenty of supply of auto sector stocks with the Treasury selling GM into the market," Richard Hilgert, an analyst with Morningstar Inc. in Chicago, said in an interview. "The only reason to pull back on an IPO is because you're not going to get the valuation you want." Since the trust "is the one driving this, if they're not happy with the valuation, they're going to pull it," he said. The trust is working to determine whether to sell its holding to Fiat directly or press forward with an IPO. "No assurance can be given as to whether or when an offering will be launched," Fiat said in the statement. "Any launch will be subject to market conditions and other relevant considerations." The $10 billion valuation was on the low end of a range from $9 billion to $16 billion, that would make the trust's stake worth $4.15 billion, less than what analysts have expected Fiat to pay. Chrysler had planned to begin formal meetings with potential IPO investors the first week of December, people with knowledge of the matter said last week. Marchionne has offered the trust at least $1 billion less than what the labor group is asking, and said the UAW "should buy a ticket for the lottery" if it wants $5 billion or more. In the IPO of the union trust's shares, Marchionne finds himself in the position of running both the company that's being listed and the controlling shareholder that opposes such a sale. The trust needs to maximize the value of its stake to pay for retirees' medical care. It estimated in a filing last month that those costs will be $3.1 billion more than its assets are worth. Marchionne is eager to avoid over-paying so the carmakers have as much money as possible to invest in new vehicles. Chrysler plans to apply to list its shares on the New York Stock Exchange with the proposed ticker symbol CGC, according to a regulatory filing Monday. JPMorgan Chase & Co. and Bank of America Corp. are leading the offering, the filing shows, with Barclays Plc, Goldman Sachs Group Inc., Morgan Stanley and UBS AG also serving as underwriters. Deutsche Bank AG is advising the union, according to a person familiar with the matter.